The heart and soul of modern electronics is the semiconductor. It is hard to imagine almost any modern product without a semiconductor as its brain, from the smallest piece of consumer technology to the largest industrial machine. Indeed, the continued development has taken the consumer market by storm, with some of the most humble devices boasting computing power far in excess of the banks of computers that took man to the moon in the 1960s. For most of their lives, semiconductors are mounted to a printed circuit board and are buried in the heart of a device. And with good reason. For all of their qualities as computing devices, semiconductors are fragile things and must be protected. Rarely will semiconductors see the outside world, protected as they are by cases, enclosures and shields. But there is a family of components that must face the world undaunted, with nothing but themselves to resist the worst that the world can throw at them. Connectors are the true superheroes of the modern electronics industry. Wherever a piece of electronics is found, the chances are good that there is a connector providing the interface to the outside world. It is the connector that carries power, signals and data into and away from a device. Just as the equipment they are fixed to must work in some of the most demanding environments on Earth (and sometimes not on Earth), so too must connectors perform flawlessly. When we talk about harsh environments, one of the first thing that springs to mind is water. Any device that is destined for use outside must be protected against the elements, the most obvious of which is rain. IP (Ingress Protection) ratings are a familiar way to signify whether products are waterproof, and the range of IP-rated connectors that is available is huge and varied. 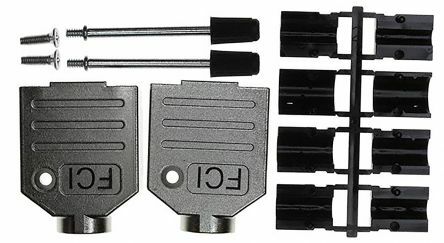 Molex Mizu-P25 Splashproof Connectors. Can your semiconductor do this? Water is only liquid at certain temperatures. There are plenty of environments where the luxury of running water is not available. Connectors have to work in the cold of arctic conditions and in the heat of a vehicle engine bay, temperatures at which water might freeze or boil, temperatures at which would be harmful to other components. Semiconductors are regularly tested using "burn-in" techniques, where components are subjected to high temperatures, artificially shortening their lives in order to detect latent failures. But exposing a semiconductor to high temperatures during operations would also shorten their lifetime, creating a shorter than expected time before failure. But sometimes, simply being protected against water is not enough. Even a waterproof connector can fail if water is replaced by more aggressive chemicals. Everything from seawater to cleaning chemicals can severely damage a connector if it is made of the wrong materials. And it can happen in the most unlikely places. I once met a designer whose job it was to design cookers and stoves for domestic kitchens. He told me that the average kitchen is amongst the harshest environments around, with everything from concentrated acid (orange juice) and aggressive chemicals (everyday kitchen cleaners) to harsh abrasives (scouring pads) and extreme temperatures ready to destroy his hard work. Can you imagine a semiconductor in this environment? Connectors can even offer the last line of defence against electrical interference, such as those within the Amphenol 8655H Series (160-0027). The problems caused by EMI (electromagnetic interference) and even EMP (electromagnetic pulse) can prove fatal to delicate electronics, and the shielding provided by metal-shelled connectors and enclosures provides much-needed protection against everything from lightning strikes to coronal mass ejections. Such events, although rare, can cause disruption on a massive scale. As if this was not enough, connectors are often subject to handling problems. The very nature of connectors means that they are designed to allow an electrical or electronic circuit to be disconnected and reconnected, sometimes on a very regular basis. Connectors are often measured in mating cycles - one cycle being the act of mating and then breaking a pair of connectors. Some types of connectors destined for such regular use have lives measured in hundreds or even thousands of mating cycles. Added to this must be the possibility of mishandling, even by the most experienced user. I was once handed a broken connector by an engineer at a Formula One team. It was a push-pull connector that should have been removed by simply gripping the correct part of the plug and pulling gently. The example given to me had clearly been twisted with a lot of force, and yet the user was adamant that it wasn't his fault. Connectors need to be robust and sturdy to resist this kind of abuse, such as the TE Connectivity HDSC Sealed range (164-2386). Can you imagine a semiconductor surviving such treatment? Take a look at the huge range of superheroes connectors available from RS Components here. In the latest installment, Connector Geek takes a look at the new releases from interconnect and electromechanical manufacturers. Can floating connectors solve your problems? How connectors designed to accommodate axial misalignment can help solve some design problems. Contacts (or terminals) are the heart of any connector. Different connector designs provide different performance levels. In this article, we take a look at contact design, and see how one manufacturer approaches the solution.